We have two great Camino guided tours at Easter time, so you can join a group to share your experience with. The first one is a week-long guided tour on the Classic Camino route from the market town of Sarria, departing 24th March. The group will be walking the last 111kms of the Camino Frances trail into Santiago and discovering the most popular section of the most famous Camino route. You will be arriving in Santiago de Compostela on Good Friday, just in time to experience two impressive processions taking place with the magnificent backdrop of the Old Town that evening: ‘Santo Entierro’ in the Church of San Domingos de Bonaval at 8pm and the Virgen de la Soledad procession taking place at 11pm from Church of Santa Maria Salome. We also have a guided tour on the English Camino, departing 31st March, and taking you to Ferrol, which is home to one of Galicia’s most traditional and important Easter festivals. On Saturday, at 8,30pm you can attend the striking procession of the Silence from the Sanctuary of Nuestra Señora de las Angustias. On Easter Sunday, or Resurrection Sunday, the group will have the opportunity to witness another important procession starting at 12pm: the meeting of Our Lady of the Light as she meets her son, Jesus Christ resurrected (Virgen de la luz al encuentro con su hijo). If you’d like to start your Camino during different dates or travel independently, you can always opt for a self-guided Camino tour. 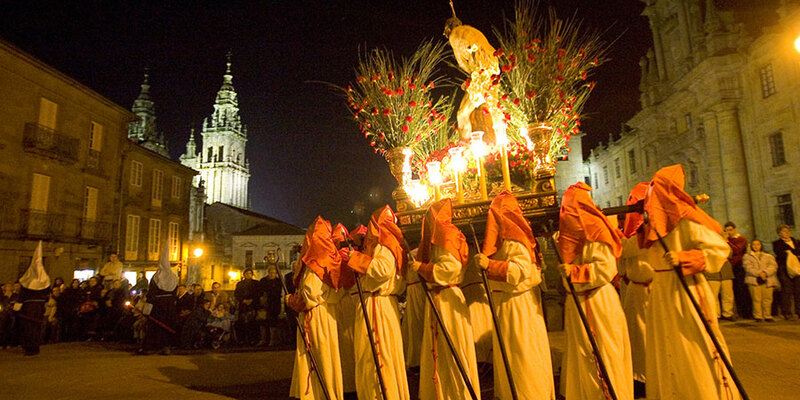 As well as Ferrol and Santiago de Compostela, many other towns celebrate Easter with processions and traditional parades, for instance Lugo on the Original Camino and Fisterra. Talk to our Camino experts about your trip ideas and they’ll be able to advise. 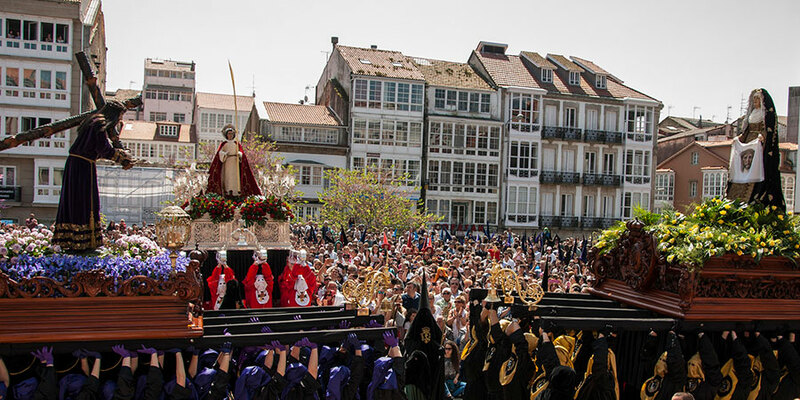 *Pictures courtesy of Semana Santa de Ferrol and Santiago de Compostela Turismo.